Today we built another iconic project of Roy’s; the patch box. This delightful grease box is cut from a single piece of stock and has a cunning catch arrangement to keep your mutton tallow safe. As with all the projects we have done this week, what at first seems like quite a simple project has deployed a number of core skills in unusual ways. 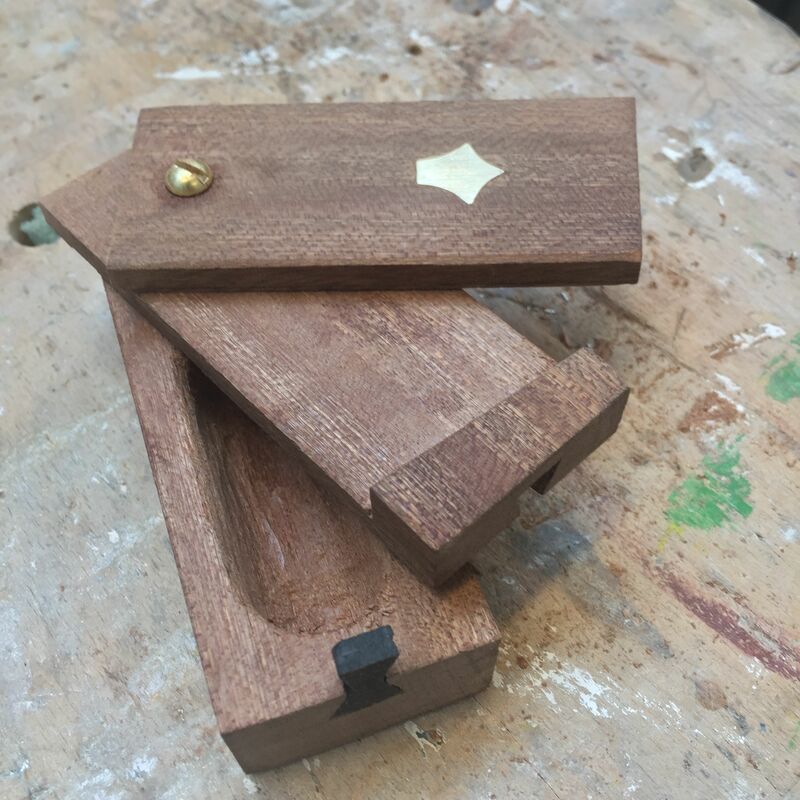 Having laid out our patch boxes in mahogany (salvaged during yesterday’s skip dive), we got to use Roy’s passer drill to route out the recess for the brass inlay we cut yesterday. The passer drill is truly a remarkable device, and entirely different to any routing method I’ve encountered previously – this tool has the possibility of providing endless fun. 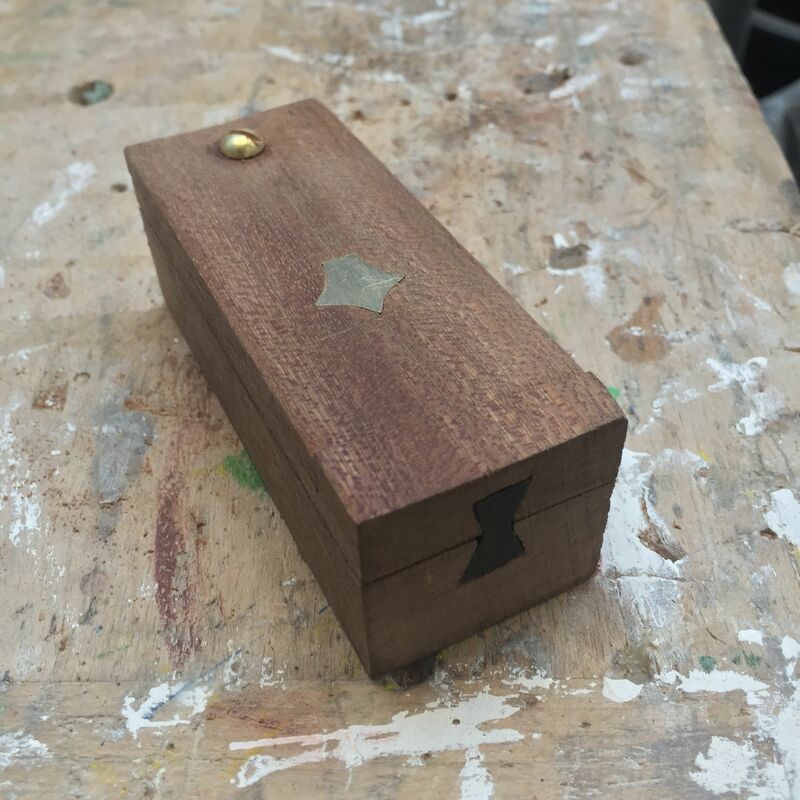 An ebony butterfly was inset into the opening end of the box, with the bottom half in the main section of the box and the top half in the lower sliding layer. 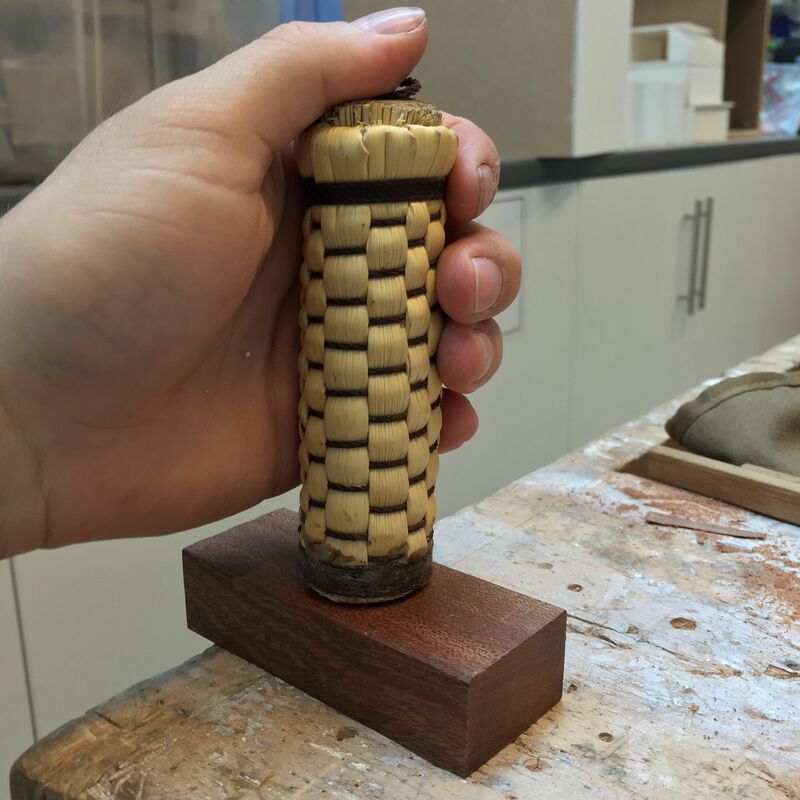 The catch mechanism was completed with a single brass screw at the opposite end of the box, and the screw hole of the middle layer was elongated to allow the layer to slide back and forth as well as pivoting. This ingenious arrangement means that the box can only be opened if the two lid layers are moved in the correct direction and sequence. Brilliant. A box with no interior compartment is not much of a box, however. To create a compartment we drilled out the interior of the main box section using an antique spoon bit and brace. To my eternal shame I’ve not used a brace and bit before, although I hope to remedy this as soon as possible (and I’m keeping my eye out for a good condition 10” brace). 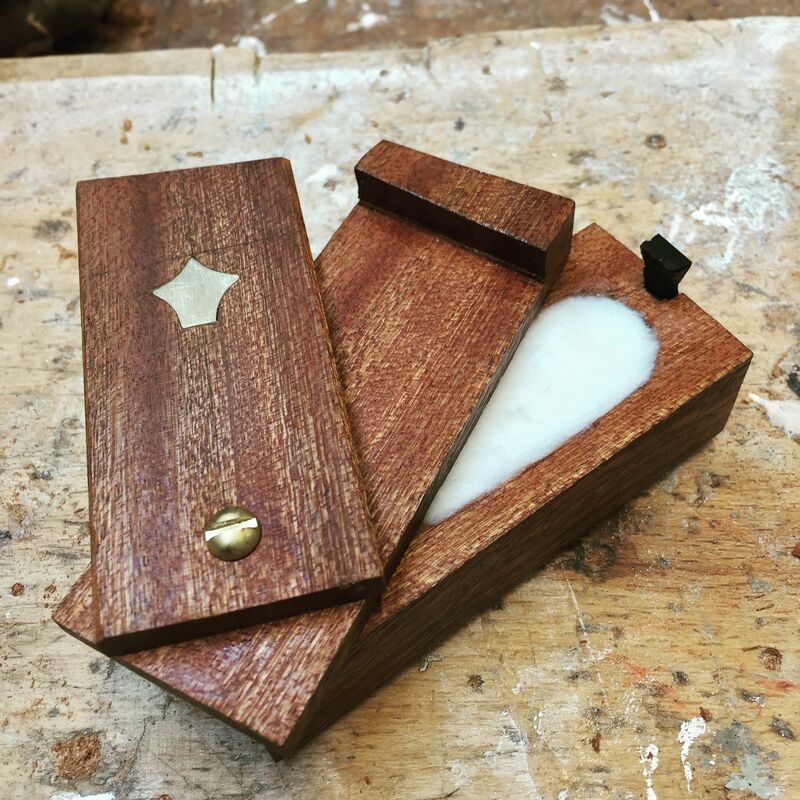 Tomorrow I’m hoping to give the box a coat of shellac and wax, and then fill it with my mutton tallow substitute of choice. This has been another super fun project, and one which I may well build again as gifts. Many events occurred today which I never expected when I signed up for Roy’s class last November. We started off the day with a healthy amount of metal work for two separate projects. 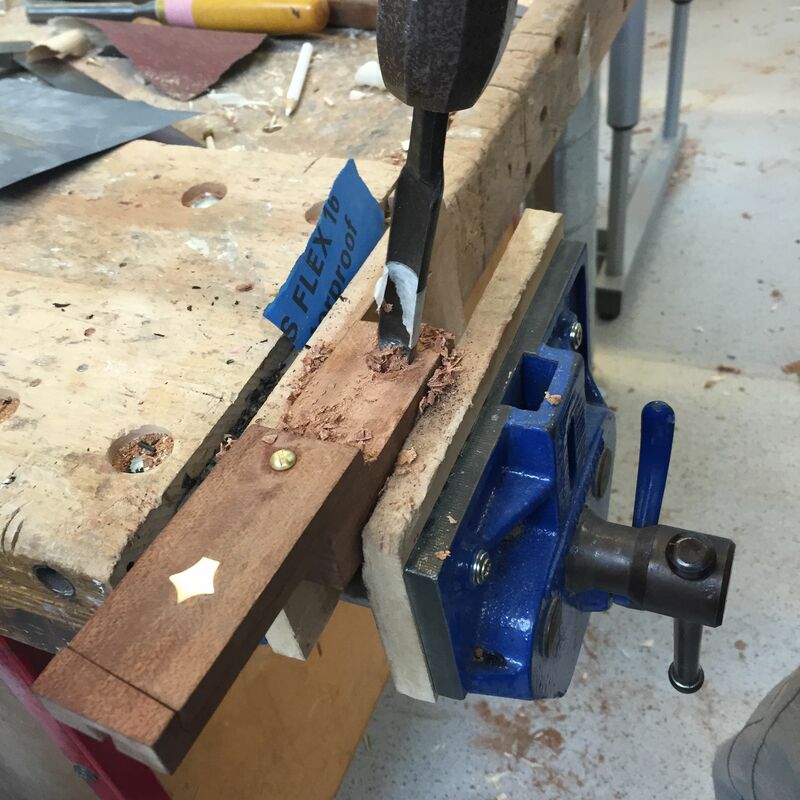 One involved cutting copper pipe, beating it into a square cross section, drilling out screw holes and then soldering on nuts to accept the screws. 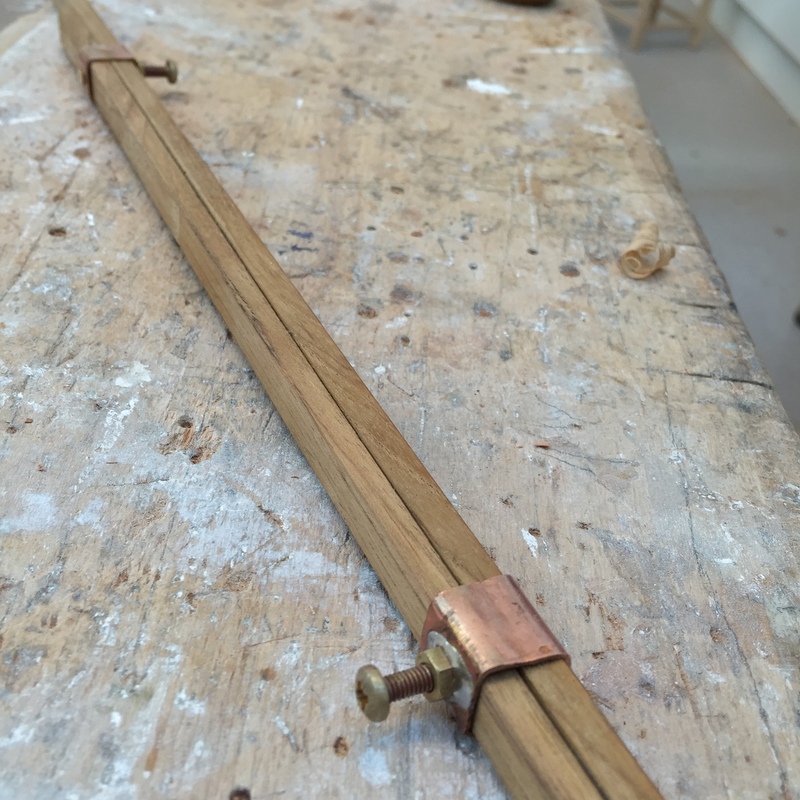 These are to be used for a set of pinch rods, with two copper fixtures apiece. 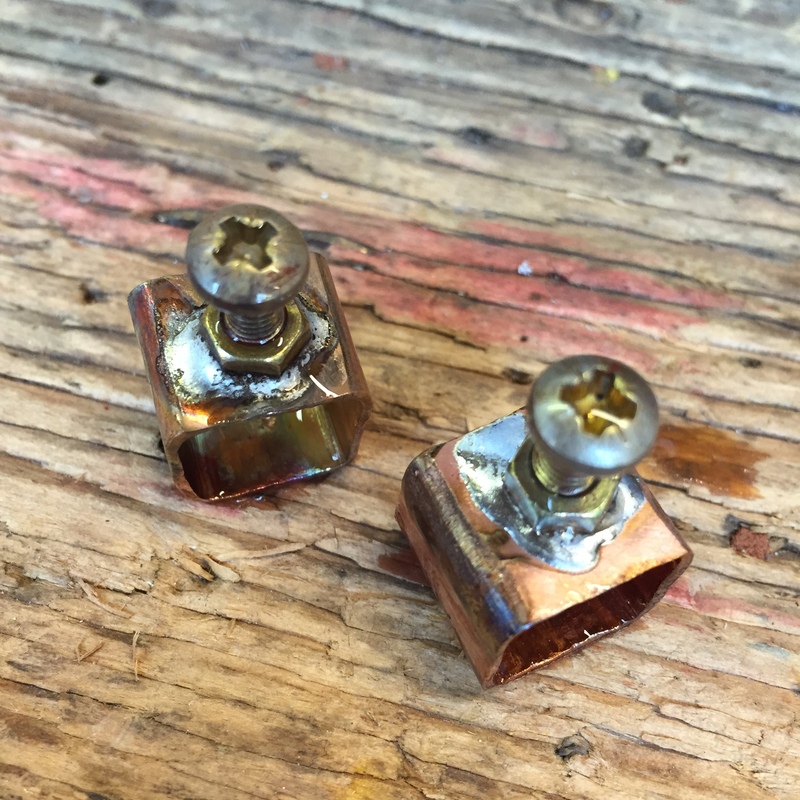 The only soldering I’ve done previously is guitar electrics, so using a ruddy great gas torch for soldering the copper bracket and brass nut was a new experience. The second element of metal work was cutting brass inlay for use with Roy’s amazing passer drill on a project we will start tomorrow. I was more familiar with this work, having cut a fair amount of shell inlay for my guitars, but 3mm thick brass plate was a very different sort of material to work with. Lots of fun, and I’m quite pleased with how my inlay came out. More parallel skills, more experiences. Perfect. 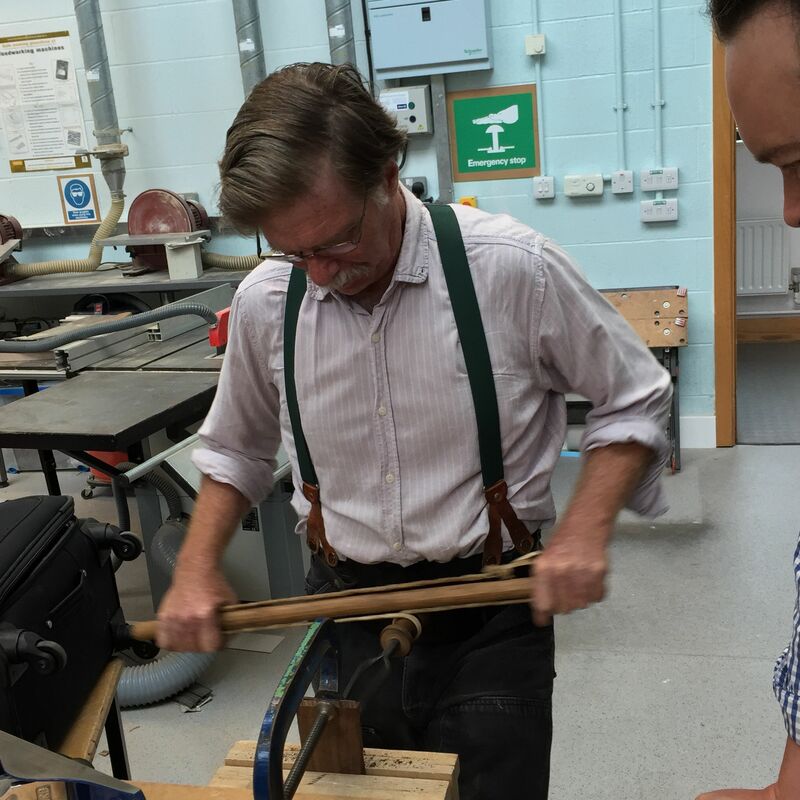 As a final treat, Roy taught me how to play the saw. So expect more boings, squarks, and 1950’s sci-fi sound effects on my next brace of recordings. 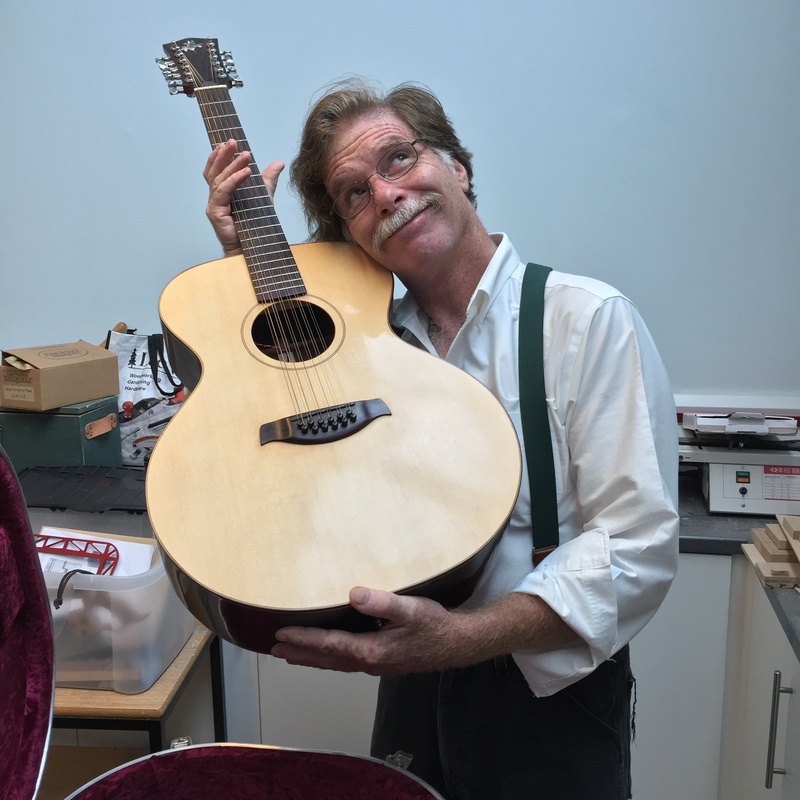 I may have to see if Mark has any nice vintage rip saws for sale – I prefer my musical saws to be in A sharp (A Sharp Saw, geddit? Yes ladies and gentlemen, I’m here all week. I think Ethan would be proud of this one). Now if you’ll excuse me, apparently I have to play an open mic night in front of my course mates and instructors. There’s no way this can go wrong, is there? What a first day on the course. 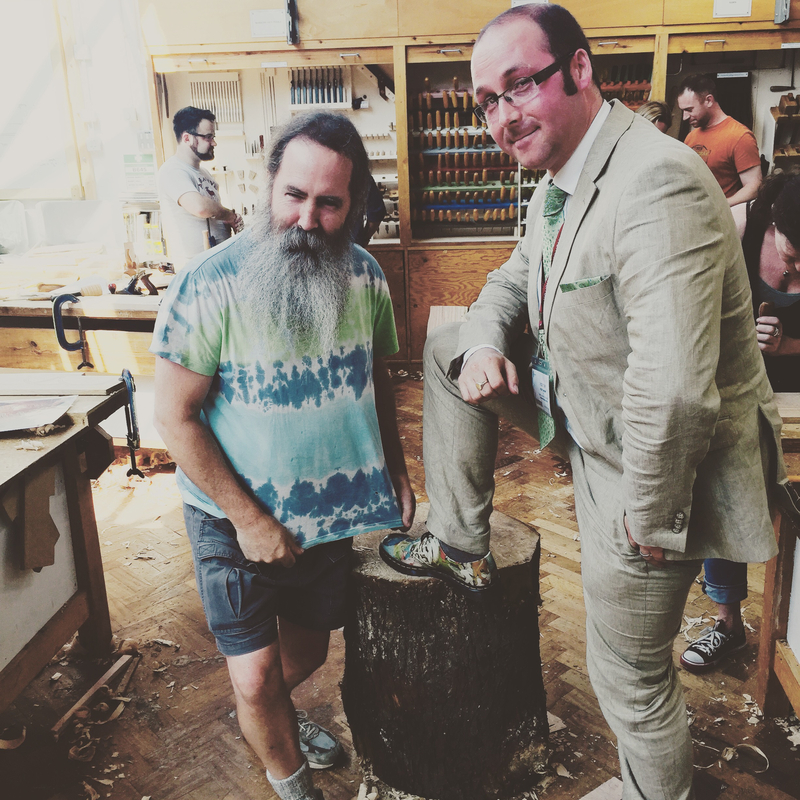 It is hard at this point to know exactly what to write about, because unlike last year’s very focused Anarchist’s Tool Chest class, Woodworking with Thomas Jefferson is a little more… sprawling in nature. The overarching theme however is easy to spot; Roy’s unbridled enthusiasm for spending time (and facilitating) whatever we are interested in. 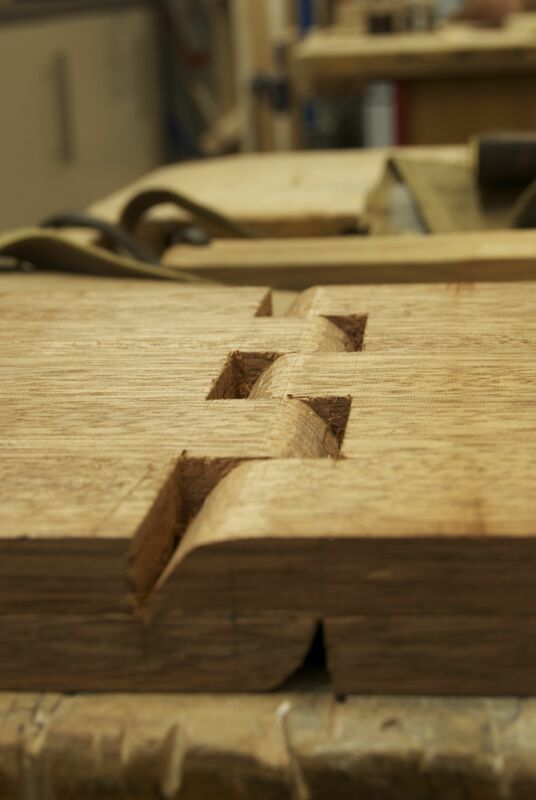 The main focus of today was building the iconic Roubo bookstand (which has been on my project list for several years), but we have also had a crash course in sharpening handsaws, the use of passer drills, and a brief glimpse into what can only be described as Roy’s suitcase of dlights. 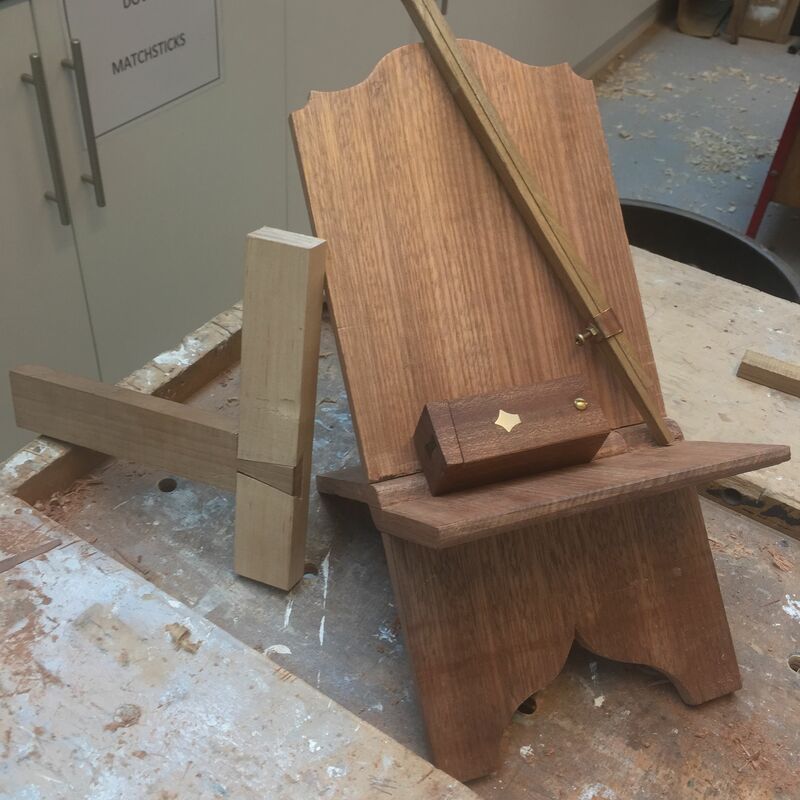 It looks like the rest of the week will be working on mitre shouldered rising dovetails, Roy’s infamous Mystery Mallet, a sample easel from Jefferson’s five-book rotating lectern, and anything else that Roy can think of. 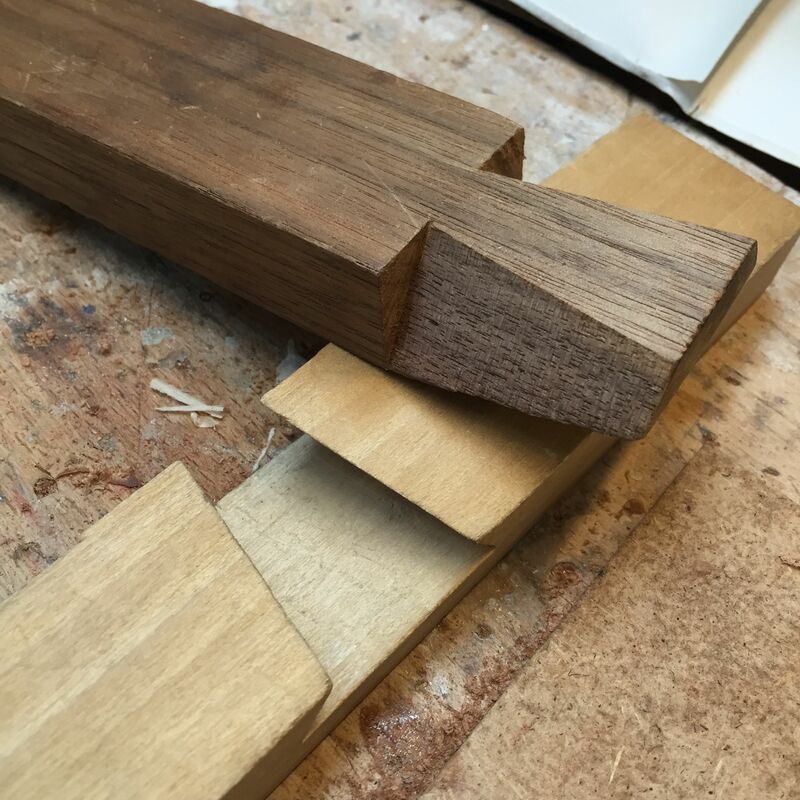 It occurs to me that the best way to think about this week is not in terms of the projects or “outputs” to be built, but as an opportunity to build up a new set of parallel skills, some of which I may never use again, but all of which will undoubtedly make me a better woodworker. And that is super exciting, given all of the time I have spent thinking, and writing, about parallel skills in the past year. Being less output driven than the ATC class I took last year means that there is more opportunity to just soak up the skills on offer and follow some interesting rabbit holes. 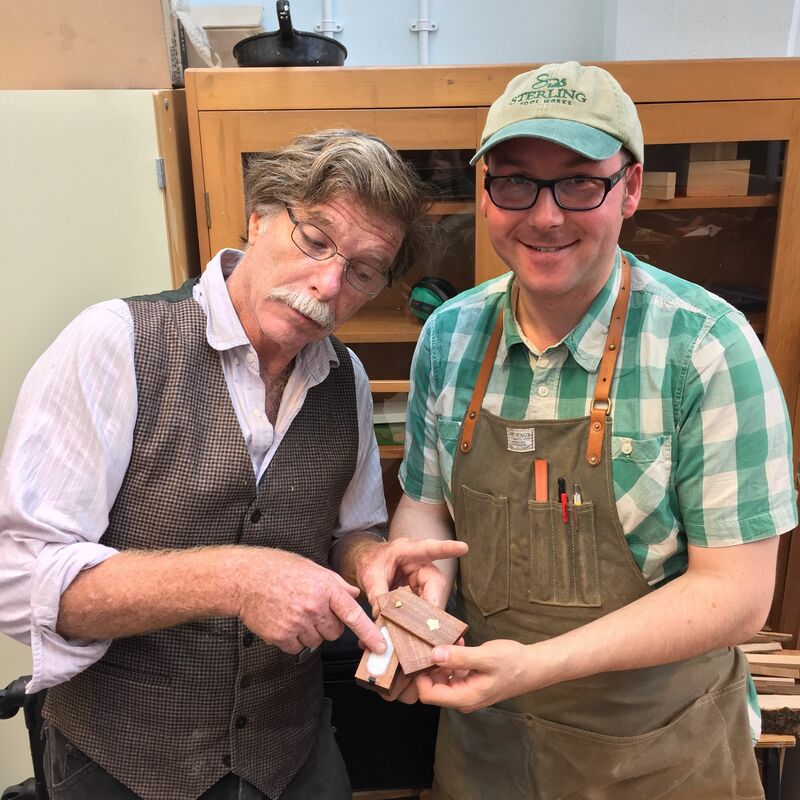 Roy is an incredibly charming and knowledgeable teacher, as well as being just as funny as he is on the Woodwright’s Shop, and seriously enthusiastic. So much enthusiasm. So much. 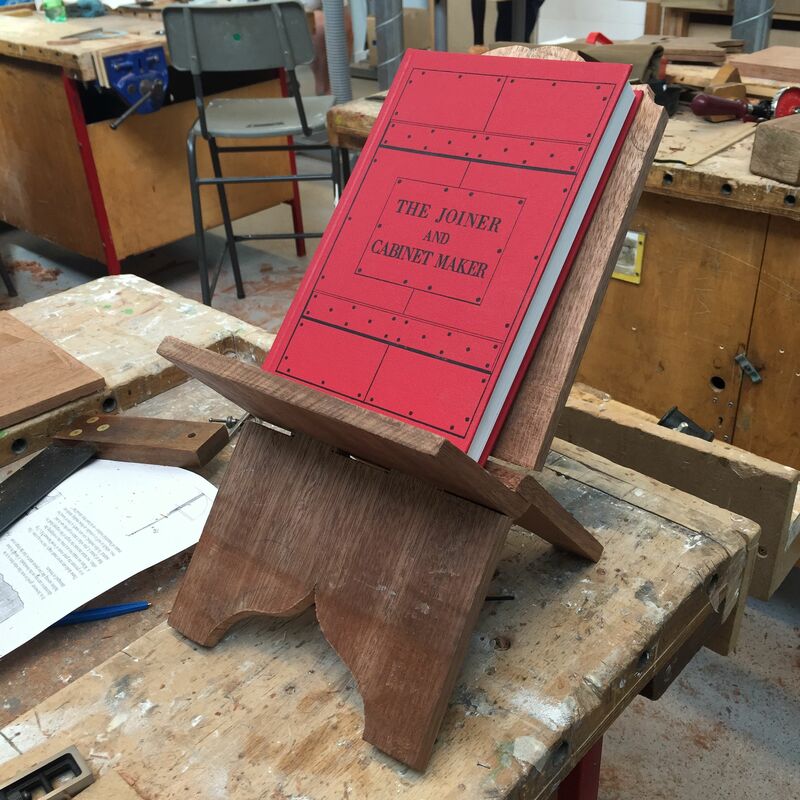 As I mentioned, the focus of today has been on the Roubo bookstand. I don’t intend to give a blow-by-blow account of building the bookstand right now (I will save that for a future entry), but for the uninitiated the project is a folding bookstand made out of a single split piece of hardwood (in this case 9” wide, 1” think mahogany). 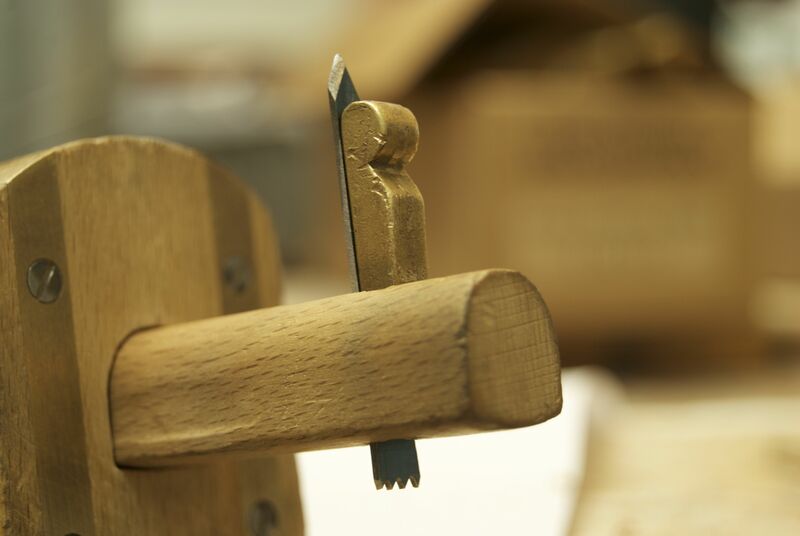 A hinge is carved into the stock, and then the thickness of the stock split in two so that the two pieces can rotate on the carved hinge. Seriously clever stuff. So the bookstand has thus far involved cutting a dado to allow access for a bow saw for splitting the thickness of the stock, (surprisingly!) bow sawing the stock (which is very different to any other type of handsaw work I have done previously) before, and carving the hinge from both sides of the work. 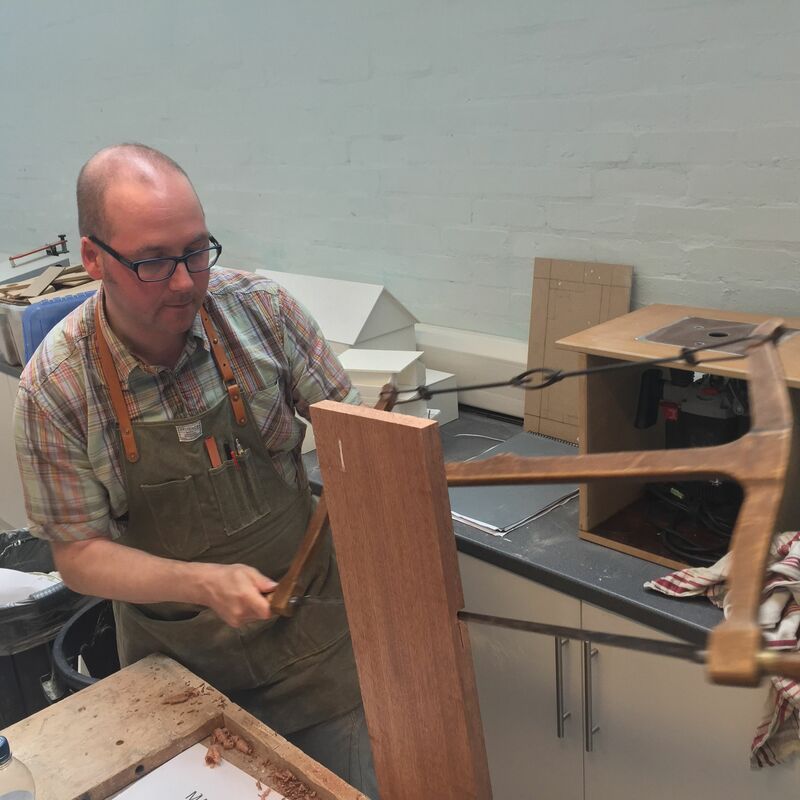 Using a bow saw to split the mahogany stock for the bookstand. I can’t wait to get back into the workshop tomorrow morning and see what else lies in store for us! 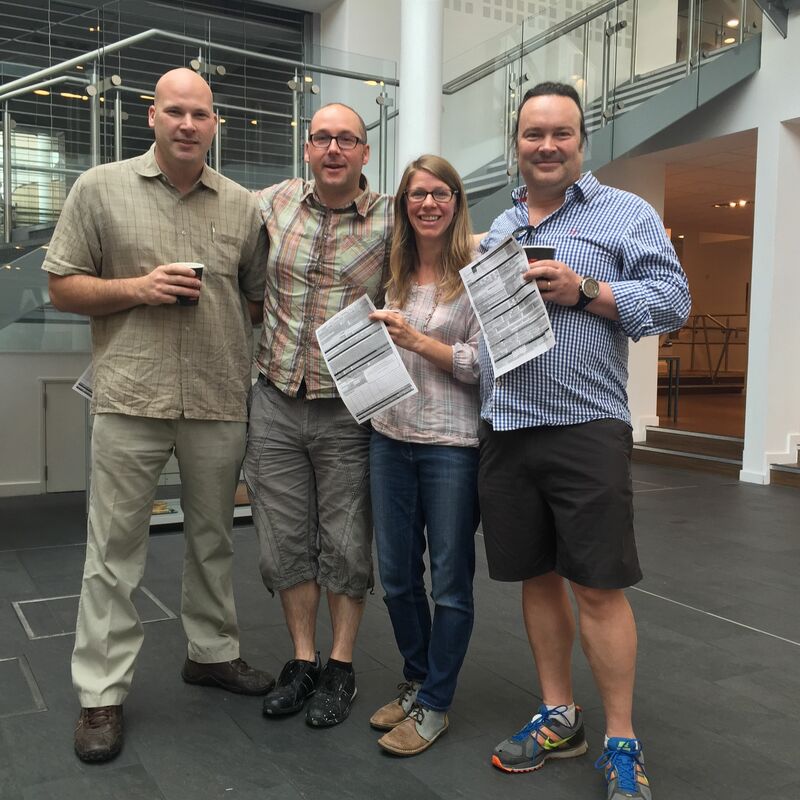 The New English Workshop summer school 2015 is now in full flow. 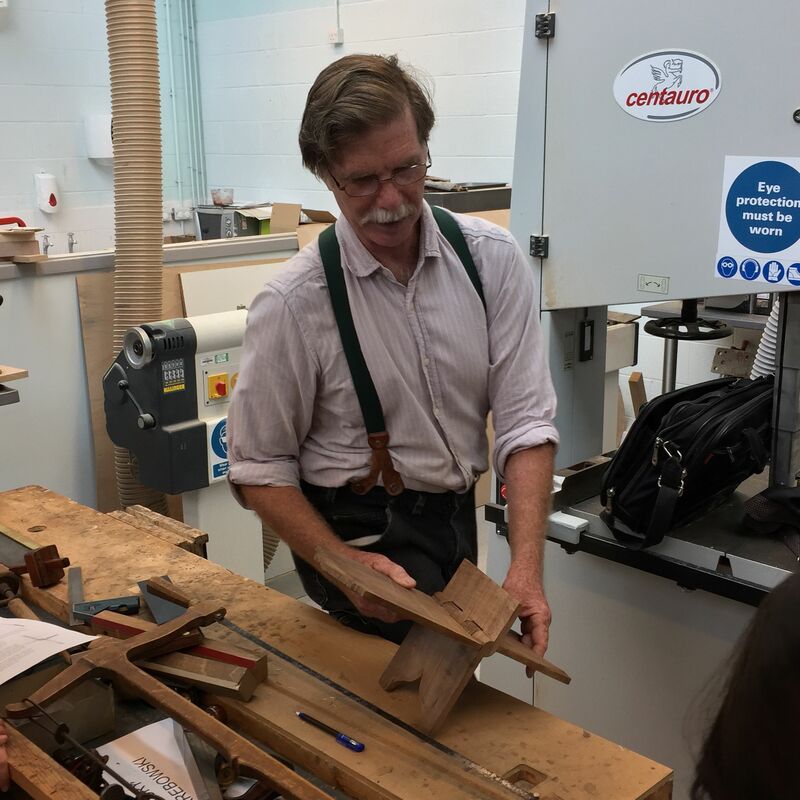 This week saw David Barron and Chris Schwarz teaching down in Bridgwater, Somerset, while Peter Follansbee and Tom Fidgen were running classes in Leamington Spa. 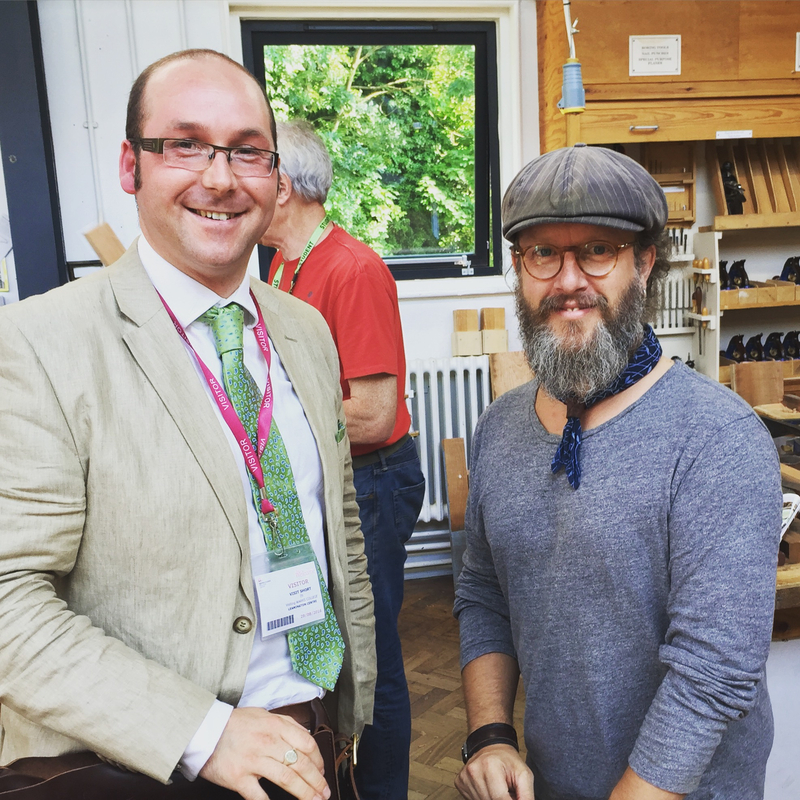 It was great to meet Peter and Tom, as they are both incredibly knowledgeable and passionate woodworkers with a wealth of experience, and brimming with ideas. Hopefully they will return to Her Majesty’s Realm in future years, as I would love to take courses with both of them. 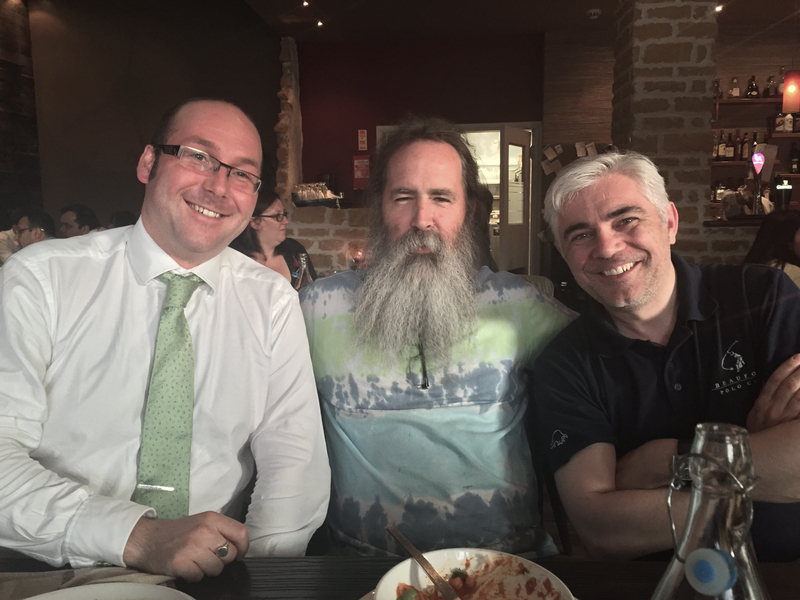 It was also great to catch up with Jamie Ward of Warwickshire College, Matthew Platt of Workshop Heaven, and see a couple of fellow survivors from last year’s Anarchist’s Tool Chest. 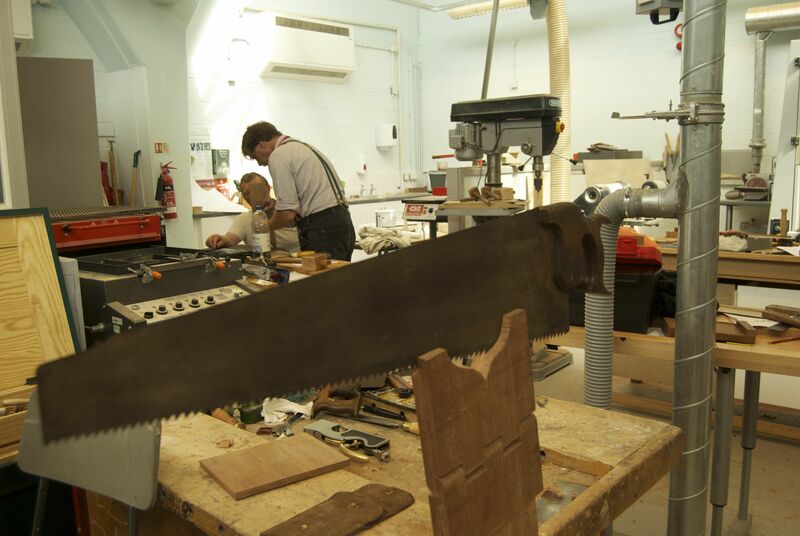 Tomorrow I start the Woodworking with Thomas Jefferson course with Roy Underhill. 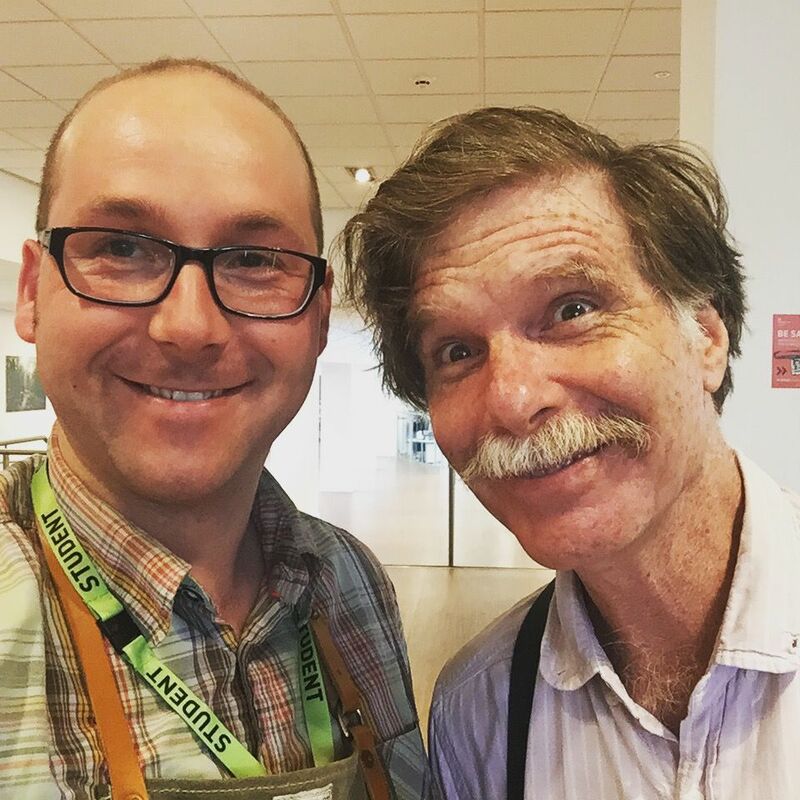 As I did on last year’s dovetail death march with Chris Schwarz, I will be blogging daily from the course. 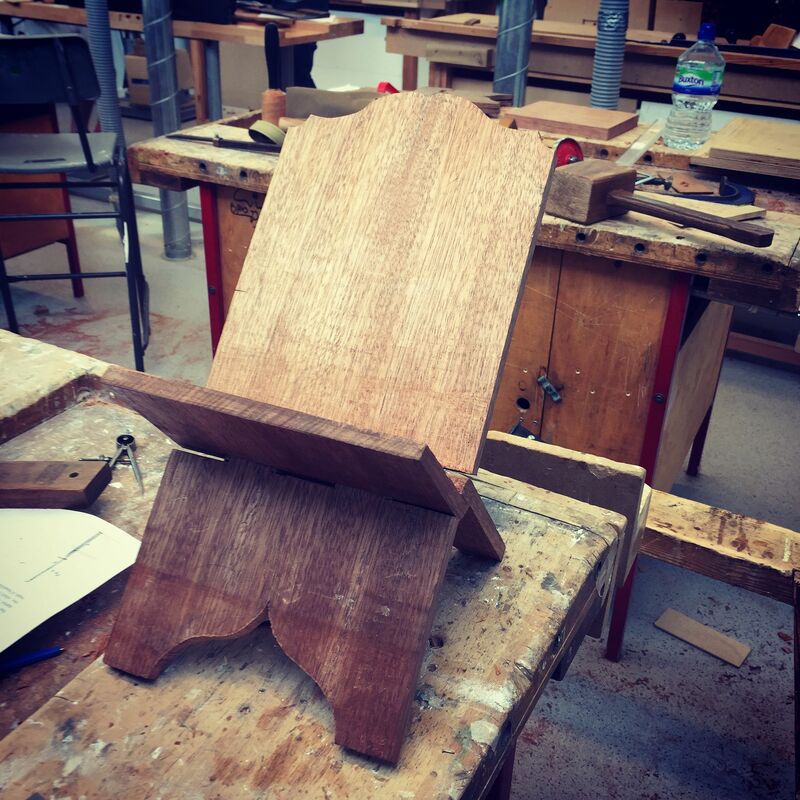 So tune in every day next week to read about the day’s woodworking (and my daily battle not to squeal with excitement like a teenage girl at a One Direction show).